I wanted to thank you for not only your excellent service, but also the quality of the queens. Over the years your queens have proven to be about twice as mite resistant as nearly every other stock I’ve tried. They are super hardy, winter well, and are nicely gentle. I’ve never seen any foulbrood. I know that Russian stock has a reputation for not brooding up early in the spring as quickly as other lines, but with a little coaxing your bees easily reach the eight frame average required for almond pollination as well as any of the other colonies I run. Most importantly, they are hardy and resistant to all sorts of stresses. When it comes to paving the way for the future of beekeeping – that is developing lines of bees that can stand up on their own and do not require chemical or other inputs – you guys “get it.” And for that I am a grateful customer. 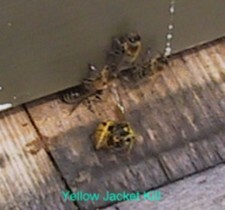 The enclosed pictures confirm what you said about these bees defending against yellow jackets. This is one of two yellow jackets I saw dead on the hive’s front porch. What surprised me is seeing this happening so early in the season. I took this picture about two weeks after bringing the bees home, so this has been about 6 weeks ago, and I’m just getting around to downloading pictures from the camera. Well to begin with I have been using Italian bees and it seems the last few years our winters have been mild, with the result that the Yellow Jackets seem to have grown in number come the fall. Last fall I was about two weeks late in installing my entrance reducers, about 1 and 1/4 inches opening versus the 16 inches a normal hive has. Restricting movement into and out of the hive is supposed to make it easier for the guard bees to stop the Yellow Jackets. Even so, I noticed Yellow Jackets were still getting in. I set up traps on the entrances for Yellow Jackets and caught three or four quarts of them. Still the Yellow Jackets were overwhelming the weaker hives of the eight I had. The Yellow Jackets seemed to know which was the weakest, and would just clean out that hive, and then move on to the next. This started in mid August and by the first week in October they had finished off my last hive. Another thing I notice, in the morning when cool, the bees were not active enough to defend against the Yellow Jackets and that is how Yellow Jackets seem to get a foot hold in the bee hives to wipe them out. I’m just a backyard hobbyist, but wanted to provide you with a little positive feedback on the queens that I bought from you last year. I tried them in three of my five hives. They wintered well, although the winter this year was mild in Eastern Washington. A few dandelions just opened up this last weekend and and the bees are on the job. They seem to believe that a 55F day with a few sprinkles of rain and some wind is paradise. I do not witness that kind of activity with queens that I ordered out of Southern states. One of the requeened hives is surprisingly strong right now. Mites hit hard and reduced the bee population before I got the honey pulled off last summer. I knocked the hive down to a single deep hive body, replaced a Buckfast queen with one of your queens, treated it for mites, and started feeding. The population still seemed low going into winter and I almost combined it with another hive. I mentally prepared myself to find a dead hive in January. It is a very strong, active hive right now. They are all being fed sugar syrup and pollen substitute since the end of February, so we’ll see how spring buildup goes. I ordered queens from you in 2010 and 2011. I’d like to order again in 2013. The queens you sold me in 2010 were over-wintered, and I sold them to a man the following spring 2011 that did a promotional for Jack Daniels Tennessee Honey, filming the bees from your queen. It took a paint scraper to get Jerry’s jaw off the floor. Thank you both for your wonderful efforts to develop healthy bees. I got started keeping bees again when Africanized bees attacked me in front of my house several years ago. Using the methods to keep bees that I learned 35 years ago led to overwhelming nosema and varroa problems. I went to the chemical management approach with marginal results and started evaluating the genetics research being done to avoid using this approach. I read just about everything I could in the journals and started getting Russian queen bees. They did better and I got better at managing them but it still took minor chemicals like essential oils and Fumagillin to make it. We started buying replacement queens from Olympic Wilderness Apiaries and stopped using all chemicals except essential oils in feed for winter on splits. In the last two years using your queens we have produced honey at 115#/ hive and then 135#/hive. I normally re queen every fall but this year I kept my best producer from last year, no chemicals or essential oils now for over a year and she produced 160# this season. Just an amazing performance in an environment where in a good year, the average commercial hive is producing 60#/year. Finally, the wild bees that I catch around my farm are no longer aggressive!!! This is the outcome goal that I started with and the honey is really a wonderful sweet bonus. Thank you again for making it fun to keep bees again!